Our vision is to build a Sustainable Financial Fund to support and empower women in the SmartStart Social Franchise Program across South Africa to build their own micro enterprise in educating pre-school children across South Africa. Our first goal is to build a R150 million fund in order to be able to give meaningful and sustainable financial support to the amount of R1 million per month for SmartStart franchisees* through partnering implementing SmartStart NGO’s like Diaconia. 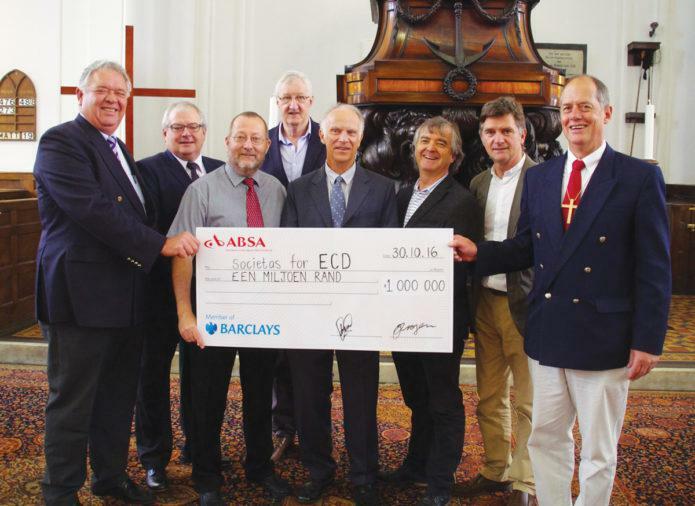 Leon Venter (far right), chairperson of Societas for ECD(NPC) receives the first donation R1 million to Societas from Groote Kerk in Cape Town. Other directors of Societas is Deon Adriaanse (second to the left) and Albert Geldenhuys (third to the right). The foundation of the transformation of our socioeconomic system should be a well-planned, integrated high-quality education and training system that stops the wastage of talent in our youthful population. We need to support families and enhance quality of human settlements to ensure the first 1,000 days provide healthy nurture and stimulation of all children. Societas partner with all NGO’s across South Africa who implement the Social Franchise ECD concept of SmartStart. The Social Franchise Concept of Smartstart is a brilliant vision to help change the future of 1 million of the poorest pre-school children and 50 000 jobless women in South Africa. Smartstart’s brilliant and successful strategy of ECD social franchising is already changing the lives of more than 18 700 children. Societas builds a sustainable fund to financially support the implementation of the SmartStart vision and strategy through local implementing NGO’s (like Diaconia). SmartStart and their local implementing NGO’s (like Diaconia) identify, train and support women to start their own micro-business in pre-school education in the poorest communities. The SmartStart franchisees are supported with seed capital for their developing ECD businesses, help with infrastructure, food for the children, outreach to and mentoring of parents and the provision of educational products, as well as ensuring ongoing support, training and mentoring to ensure they grow their micro ECD businesses. Societas provides financial support to local start-up SmartStarters. This financial assistance flows through the local NGO’s that identifies, train, coach and support these Smartstart micro ECD businesses that pop up all over South Africa.